Here is something for the long weekend: To mark the 67th year of the Cannes Film Festival, the Grande Maison Champagne House will launch an exclusive limited edition Cannes version of the Piper-Heidsieck Brut NV. 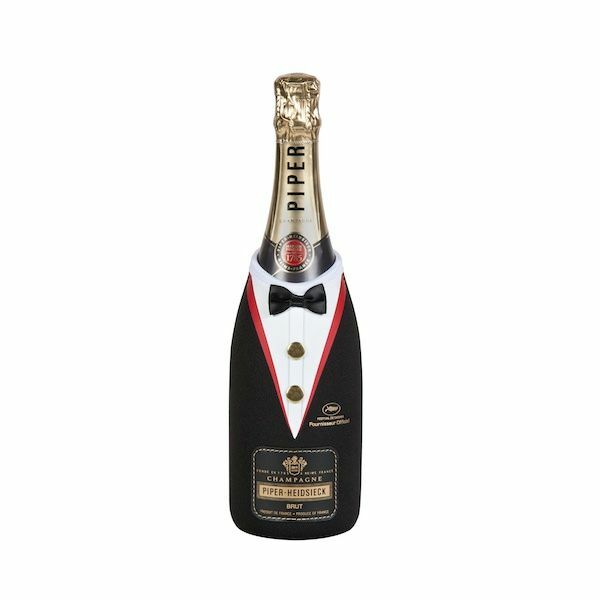 The classic red and gold Piper-Heidsieck bottle has been given a dazzling movie premiere makeover, styled with the iconic black tie and jacket with crimson-red tailoring and gold fastens. This limited edition also marks Piper-Heidsieck’s 21st anniversary as Official Champagne Supplier to the legendary film festival. Hollywood legend Marilyn Monroe famously claimed that she wears only a few drops of Chanel No. 5 perfume in bed, and begins the morning with a glass of Piper-Heidsieck champagne. Well, if it is good enough for Miss Monroe. From the beginning of May 2014, the Piper-Heidsieck Brut NV Black Tie bottle will be available at selected stockists for RRP £36.69. Here's to the long weekend and finale of the Cannes Film Festival. Catch up on all my #Cannes2014 related postings here.